In Bottle: A really, really light vanilla and some slight green notes that almost feel sour in the back of the throat. Applied: I really doubt my friend supplied me with a faulty sample and I fully believe the weakness of this sauce is due to Creed’s mixing. Or maybe it’s me. Whatever it is, I hardly get anything out of this. 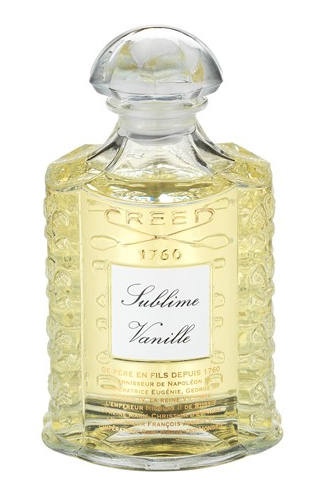 It smells of barely there vanilla and kind of leaves me wanting a lot more, especially after finding out its price tag ($710.00 on Creed’s website, if you were so inclined). I get a little hint of green sourness that I want to attribute to some kind of citrus. The two actually go pretty well together in the kind of way that you wouldn’t expect. Like those Terry’s chocolate orange things. Except unlike the chocolate oranges, this lacks in flavor, being kind of a weak throw type of scent. I feel like I need to line the inside of my nostrils in order to smell it. I can’t say that I am a fan. Extra: Creed’s Sublime Vanille is a part of a collection of exclusives from the house. The flacons are beautiful and the price tag matches the aesthetic. Design: Gorgeous design. I love the bottle, it looks nice and weighty and absurdly expensive. If someone were to break in one day, this would likely be the thing I’d hurl at them first–then I would regret it later. What? It’s $710 for stuff that barely smells like anything. I can be snarky. 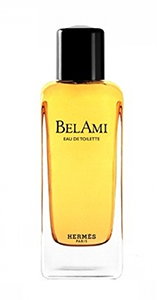 Notes: Vanilla, tonka bean, orchid, musk, bergamot, lemon. Maybe it’s because I’m older now, but I’m so much more cynical towards these pricey scents than I used to be. And perhaps the fact that this stuff costs so much that I expected so much more from it. 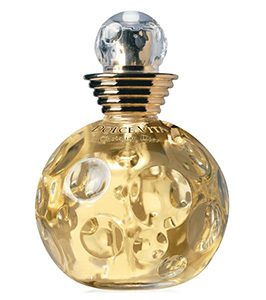 Reviewed in This Post: Sublime Vanille, 2014, Eau de Toilette. Indescret is one of those rare finds that a lovely friend supplied me with on one of her many sojourns into antiques markets, estate sales, flea markets, and all other manner of excellent places I wish I lived close enough to her to enjoy too. I’ll always be grateful when she finds a fragrance treasure and sends me even the smallest samples though! In Bottle: Heady and bitter, highly floral and possessing of that classic perfume scent that’s always hard to describe and can only be smelled and experienced to understand. Applied: Indiscret is very strong upon application. It fills my nose, floods into my sinus cavity and clears things out as it hits my brain screaming of a bitter green and sharp orange. It settles down after about an hour but don’t think Indiscret gets any more mellow, it’s a powerhouse, keeps going and evolving and growing stronger the longer you wear it. The woodsiness comes up a bit more, along with some faded floral notes, the most I get is a very rounded jasmine that adds a very nice touch to smooth out the scent. The whole thing smells classic and I wish I had the eloquence to describe that classic, vintage fragrance smell adequately because it’s a beautiful thing and all budding perfumistas or fragrance fan needs to smell and experience it at least once. Indiscret, or at least the version I have, seems to have taken on a musty lower note as it ages hours later. It has a bit of spiciness with that woodsy scent but at the same time, there’s something a bit funky about the dry down that puts me off a little, but doesn’t turn me away. Judging from the other reviewer reactions, I have a feeling my particular juice may have gone off a little, which is a shame since people seem to describe the final stage of Indiscret as a smooth, creamy woodsy spicy affair. Extra: Indiscret was released in the mid-1930s to Lucien Lelong, a very fancy brand back in the day. Indiscret was discontinued at some point, but is still somewhat available via eBay and select vintage fragrance sellers. Design: The bottles I see have lovely, classic sweeping feminine curves and a beautiful looking flacon. If I could get my hands on it, I totally would. There are other designs as well, ranging from simpler rectangular flacons to mini sizes to more modernized bottles with shiny metallic-looking caps. Notes: Mandarin, bergamot, jasmine, tuberose, orange flower, rose, ylang ylang, geranium, iris, galbanum, woods. Like most fragrances my friend picks up from antique stores, I can’t fully classify the year of the bottle and can only guess. My only recommendation for this one is to look for it, the more vintage and pure the better the experience. It’s a beautiful, full-bodied, very long-lasting vintage beauty! 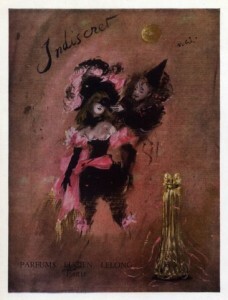 Reviewed in This Post: Indiscret, ~1940, Eau de Parfum. So work is starting to pick up and I might have a little bit of cash to drop on some niche and vintage goodies. And I say this with all the love I can muster for dime a dozen, easily accessible department store celebuscents that tide me over when I don’t have a decant of a rare fume on hand. Unfortunately for me, most celebuscents have lost their luster since I’ve smelled so many of them and most have the unfortunate habit of being really, really, really generic. In Bottle: Sugar and berries. Almost smells like a collection of liquified jelly berries. You know, these things: Haribo Gummy Candies. Don’t get me wrong, I love those gummy berries. 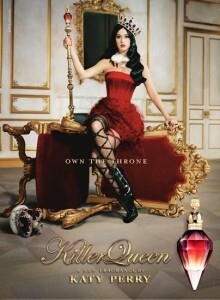 I just expected more out of a fragrance that’s going to call itself Killer Queen. Applied: Smells like sweet berries, rolled in vast amounts of sugar. Killer Queen is so sweet, I’m going to assume the killer part of it is from a sugar overdose. From what I’m smelling, there’s very little else other than the berry smell. I don’t get any jasmine, I can’t smell any patchouli or anything more sophisticated than really sweet berries. The midstage does get a little flowery. But it’s that sugary-sweet frangipani flower. The dry down is barely any different from the midstage. The sugar is still very prominent, the entire fragrance is quite one-dimensional and I mean, I guess I shouldn’t expect much from a celebuscent at this rate. But I will say I was pretty disappointed that they chose to name it something pretty awesome and then did something really lame with it. Extra: Killer Queen was the title of a song by Queen, written by Freddie Mercury and released in 1974. The fragrance, Killer Queen by Katy Perry was released earlier in 2013. I’m going to have to throw it out there that someone else ought to take the name and make a more appropriate fragrance with it. I imagine something more powerful and unique. Maybe a number with leather, roses, a touch of sleazy civet, frankincense, tonka and amber. What about you? Design: The bottle design isn’t that bad, though I’m noticing more bottles going for the “can’t stand it upright” design approach. Not sure how I feel about that particular choice yet, but the bottle itself is pretty attractive, if somewhat lacking in creativity. Notes: Fruits, plum, bergamot, celosia, frangipani, jasmine, praline, cashmere, patchouli. I will admit that I picked up Killer Queen and decided to give it a shot at the store because of its name. This, and I somehow managed to miss the large and very prominent poster of Katy Perry with the blasted thing on her scepter posted right above the bottle display. I’m not very observant apparently. 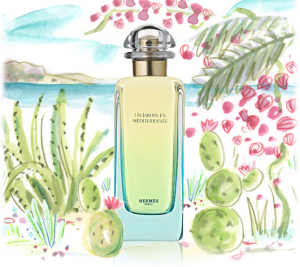 Reviewed in This Post: Killer Queen, 2013, Eau de Parfum. I was delighted when Royal Vintage showed up on my doorstep one day. I had fallen in love with the offerings from the house of M. Micallef and was looking forward to testing out a masculine fragrance from their line. In Bottle: Soft and woodsy, a nice tempered cypress with a touch of rich leather. Applied: A whiff if bergamot up front that quickly gives way to a very nice, very green cypress scent. The cypress works wonders for this fragrance, it’s evenly applied it doesn’t blast up your nose or make itself too obvious. It just simply smells right with the right level of projection and power. The leather rolls in during the mid-stage as well, lending the fragrance an added level of complexity. Royal Vintage smells masculine, green, fresh and sophisticated. It relies on woodsy and that beautiful supple leather to make its point instead of the majority of mainstream men’s fragrances that rely too much on aqua. 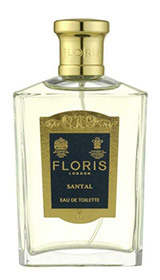 The dry down for Royal Vintage sees the leather fade away a bit with the cypress still going strong with a bit of earthiness from the patchouli carrying the fragrance the rest of the way. Extra: Royal Vintage is a new release for January 2013 and is part of the Exclusif Collection. 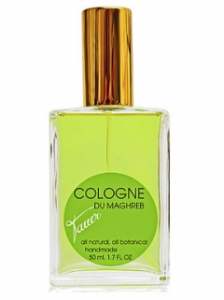 It should be available at retailers including on LuckyScent, Parfum1, and Parfumerie Nasreen. 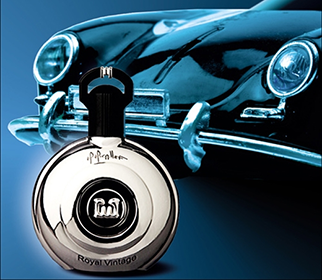 Royal Vintage is available in 100ml Eau de Parfum for $185USD. Design: Designed in a similar fashion as M. Micallef’s other offerings such as Emir and Style. The bottle is nice, organic, and simple with enough embellishments to hint at a luxury while imparting a sense of artfulness. Overall, nice bottle design. Looks great on display too. 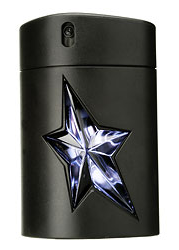 Notes: Pink berries, bergamot, cypress, leather, patchouli, musk. I really liked Royal Vintage for many reasons. Probably the two major reasons is that it lacks in the two ingredients that tend to ruin men’s fragrances for me: aqua and cedar. The cypress does a much better job as a base wood note and the lack of aqua let me enjoy the rich, full leather note. Reviewed in This Post: Royal Vintage, 2013, Eau de Parfum. Thanks to Micallef for giving me the opportunity to try this fragrance and Jeffrey Dame at Hypoluxe for forwarding on the sample.